Yes. 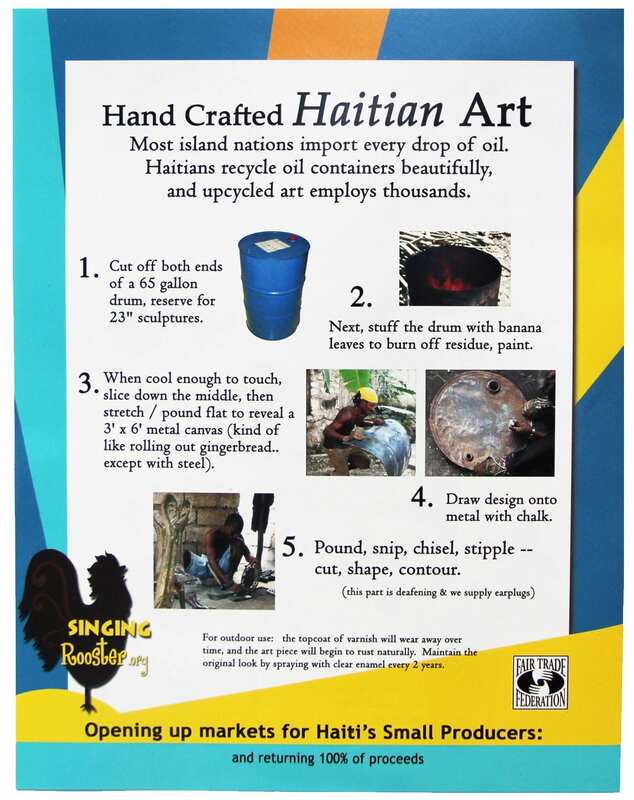 We wholesale Haitian goods to nonprofits, schools and eager individuals desiring to raise money at fundraising events (including garage sales!). Most groups we support know Haiti well, but we work with anyone wanting to use these excellent products. By fundraising with Haitian products, you’re getting quality items people want; 80% of adults drink coffee and most enjoy chocolate. Haitian art does great at big events a 3-4 times a year: fair trade festivals, Christmas bazaar, Valentine’s Day and Mother’s Day. 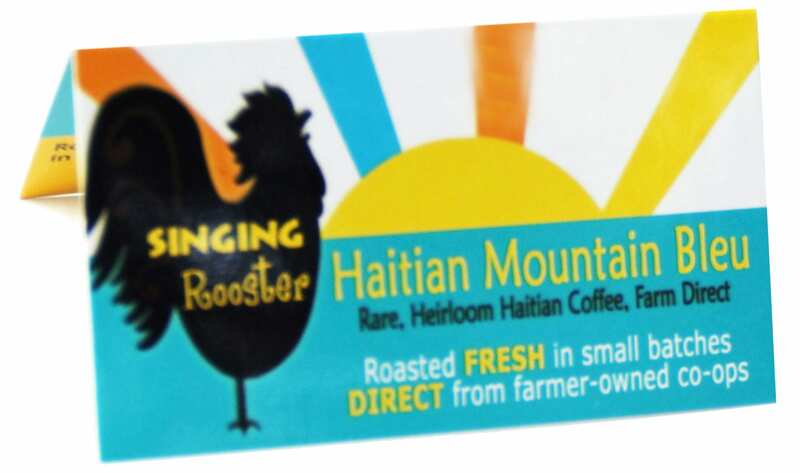 Searching for Singing Rooster Wholesale coffee in Haiti? We do that. 24, 12 oz bag minimum (mix & match roasts, mix & match types: ground, whole bean, kup). Flat shipping = $9 no matter how much you order beyond minimum — shipping to a commercial address is ideal. No P.O. boxes. Biggest bang for your buck = 48 units (it’s a shipping thing). Haitian coffee is classically Caribbean – chocolaty smooth with mellow citrus highlights. 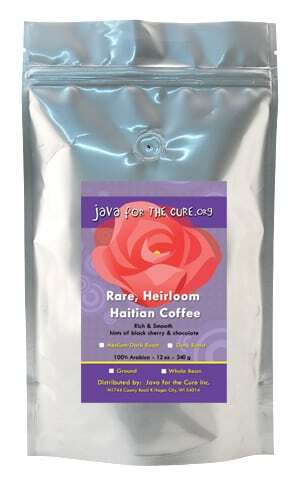 Fans of Jamaican Blue Mountain and Kona / Hawaiian coffees love Haitian. Need to try first? We sell at-cost, full bag sample pack for U.S. customers. Dark — we NEVER roast to a shinny bean level (great for photos, lousy in the cup). Our dark offers those bitter-sweet nuances of a well done roast. How much should I sell it for? Depends on your event. Generally, if you make $3 a bag or $4-$5 for premium, you’re doing well. Price it competitively w/ the supermarket & your repeat business will do well. Shelf-life: we package coffee in high barrier bags — can last for months if needed (coffee doesn’t spoil but it does stale). Ideally, you’d sell our fresh roasted coffee in 6 weeks (fresher coffee sells faster & commands more repeat business). – sell the chocolate, sell the bowl. There’s a reason why they’re all the rage. Each purchase plants an income-providing tree in Haiti. Buy 6 or 12 bags at a time — 35% margin on nibs! Minimum art order = $199 ; retail art for twice wholesale price — 50% profit margin. Art does well at BIG events 3-4 times a year (coffee and chocolate raise more over the course of a year). Get access to pricing and 1-page order form by registering an account. Must include co. name & website in the email you forward back to us after you register. We take up to 48 hours to process art orders. After we pack, art arrives fast by FedEx (no PO addresses). Consignment? Packing/shipping art is a lot of work. We tried consignment; it’s not a great fit for us. Instead: Some groups order a smattering of items to reach the minimum – then hold a pre-sale (display art, take orders, then submit a BIG order). Bottom-line: don’t want leftovers after a fundraising event? Sell art at or near the wholesale price towards the end of your event (you’ll not lose a dime). We do private label (you acknowledge the Rooster on the label) — but it works best for big clients with big sales (5,000+ bags a year). Why? Over the years we’ve learned this: many groups want their own label, spend time and resources creating labels & run out of steam selling coffee. Plus, it’s more expensive – up to 20 cents more per unit (you buy 1000 front & 1000 back stickers up front) + another 15 cents for us to put them on. A business card size sticker can say a lot about your organization – fits perfectly at the top. Download template. Follow instructions to the letter. You buy 1000 stickers up front for $65 plus shipping to your location (you put on bags). The big sticker (4.5 x 4.5″) covers the top and can say a lot about your organization. Download template. Follow instructions to the letter. You buy 1000 stickers up front for $99 plus shipping to your location (you put on bags). Full-on Private Labeling: If you anticipate big sales (5000+ bags a year) and you want your own label – Yes, we do that. Your graphic designer uses this template to create a front & back label. We order stickers & attach to plain/matte stand-up silver pouches. Follow ALL instructions. You buy 1000 front & 1000 back labels up front; you’ll order 24 bags of coffee, minimum, of the same roast (medium, medium-dark, or dark). Haitian coffee is organic by default — farmers can’t afford chemical inputs. Also, part of our mission is environmental stewardship where we’re planting tens of thousands of coffee and cacao trees (which hold delicate mountain soil, retain water, prevent run-off & bring back the birds) and are training in organic inputs; inputs help with better yields. We’re working towards official certification (costs thousands). Our Haitian cacao (chocolate) is certified organic. For each bag of coffee sold, Farmers earn over $3.50 a bag and a coffee tree is planted on deforested mountains. This is significantly higher than fair trade and helps to reverse years of deforestation. Read more about our approach. The remainder of costs — 34% — pays for export/import, transport to roastery, warehousing, roasting, bagging, shipping coffee. Fundraising is a TON of work. We’ve made some pretty fantastic materials to make it easier on you: Including photos & text you can cut and paste to use on social media. Publicity Resources save time when you’re fund raising. Add brochures, tent cards, flyers, etc. to wholesale orders. After login, find at bottom of 1-page quick shop or on marketing page. If you’re tired of the same-old-same-old — we have the best fundraising ideas ! 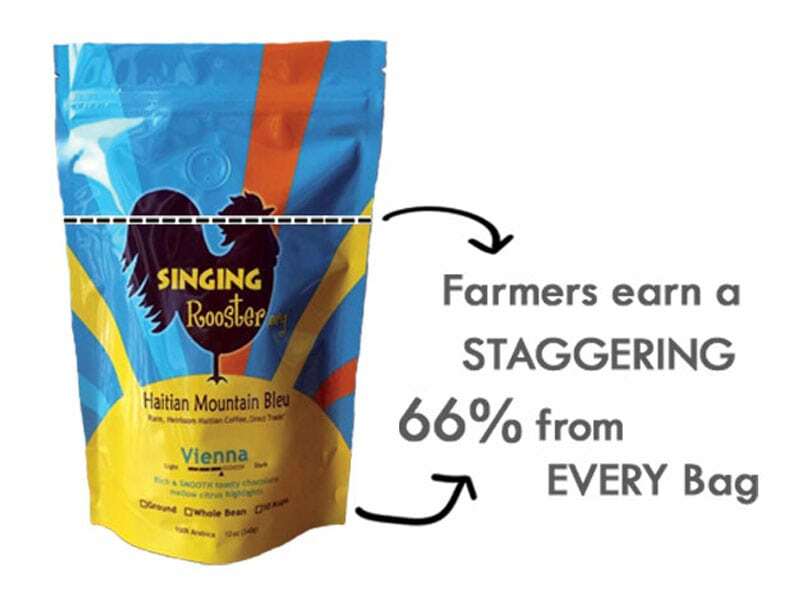 Singing Rooster works with small producers across Haiti. 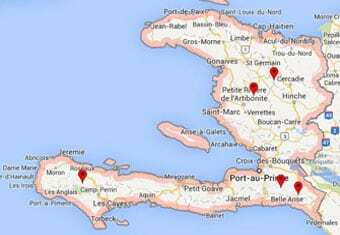 For coffee, we work as high as Dondon & the Cahos, in Baptiste, Thiotte, Jacmel, Marigot, and as far west as Beaumont. We exceeded fair trade payment for crops, and we return 100% of proceeds from sales back to farmer communities in the form of agricultural, small business management, and entrepreneurial development activities. Lots of groups claim to work shoulder-to-shoulder with producers — but most are exaggerations or plain fabrications. 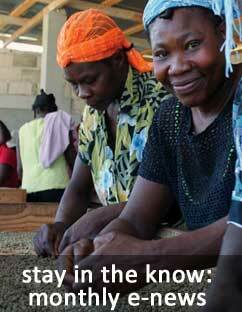 Read more about our work with coffee & cacao farmers in Haiti. We get a lot of interest about our work with farmers in Haiti. We work with established farmer-owned cooperatives (have been farming coffee and cacao for decades). Fields may be old & in poor condition, but coffee and cacao are presently growing in your area. We’re not equipped to help with brand new farming start-ups. If you require consulting or technical assistance, we offer consultation. We ask that you pay for services by using our Haitian coffee & chocolate fundraising program — because that’s how we roll! I want to do what you’re doing. We’re flattered so many have found our model inspiring and hope others build autonomy in Haiti (through agriculture or whatever means). We’re a tiny, mostly volunteer based & simply don’t have time for free consulting. If you have detailed questions & want to spend time learning about what we do – or you need technical help in Haiti – we do that. 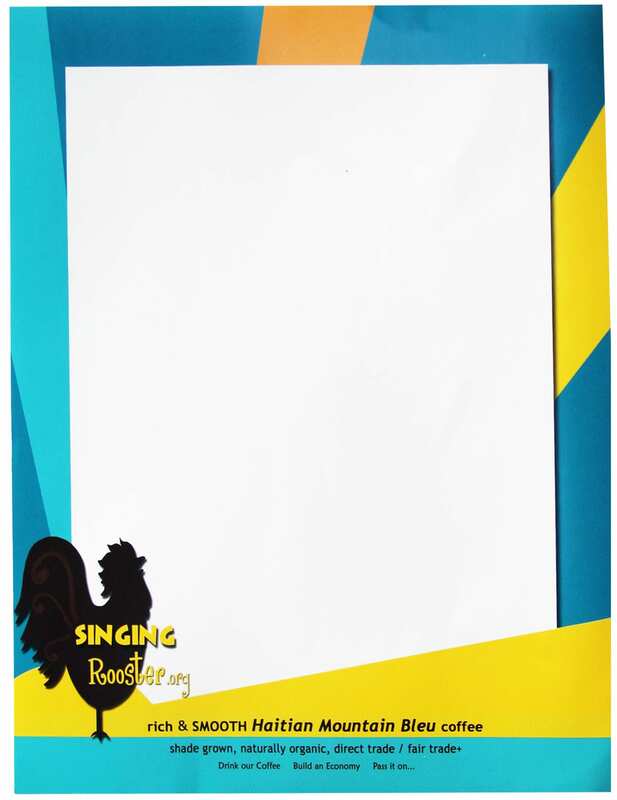 Can I get Singing Rooster in Canada? Yes! In short, the Rooster’s coffee (340 g) is roasted in Canada (ships from Canada) at Canadian postal rates. Most Wholesale Art is too expensive to ship from the U.S. to Canada (sorry). But if items fit in flat rate boxes (small items) and you fill that box, we’ll ship it. Have a significant art request? Buy a minimum of $950 U.S. – we’d ship from Haiti to Canada. Other details apply – call us: 608-721-0622. We ship retail art to Canada all the time — can be pricey, but we have lots of happy Canadian customers. We can’t control if you’ll be charged duty. More details here. Yes. 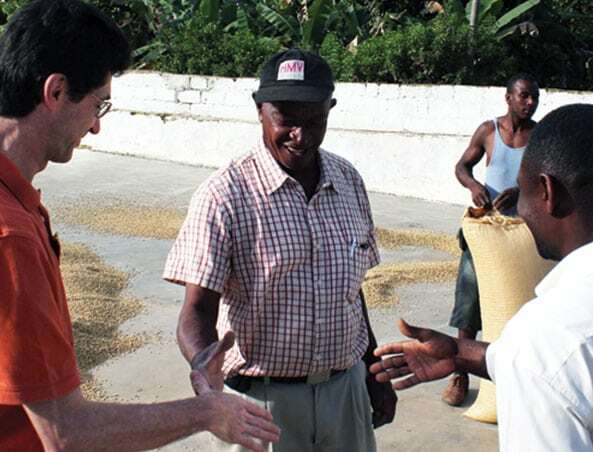 Our wholesale coffee program is growing in Haiti: guesthouses, shops, hospitals, etc. Email Molly for details & then to place an order (coffee delivered in Haiti). More details here — or contact us so we may better serve you. Still have questions? Shoot us an email.